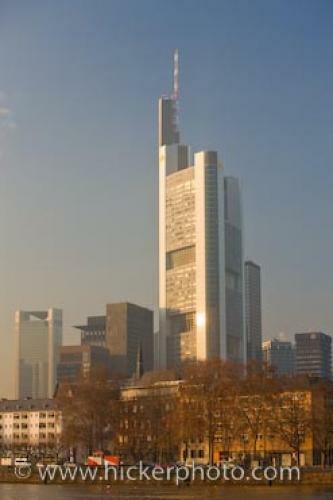 The downtown core in the city of Frankfurt in Hessen, Germany has two of the tallest skyscrapers in all of the European Union. Frankfurt am Main, more often just called Frankfurt, is the largest city of the state of Hessen, Germany and is one of the four cities in Europe to have a number of skyscrapers. The Commerzbank Tower (259 meters) and Messeturm (257 meters) are the two tallest skyscrapers in the European Union, although the Triumph-Palace in Moscow is the tallest on the continent. Although Frankfurt, Germany is only the fifth largest city in Germany, with a population of 670,000 (2008) it is still the transportation and financial hub of Germany. Frankfurt is also a multicultural city with 180 different nationalities living here, including the second largest Korean population in Europe.Skyscraper in downtown Frankfurt, Hessen, Germany, Europe. of Frankfurt in Germany, Europe.